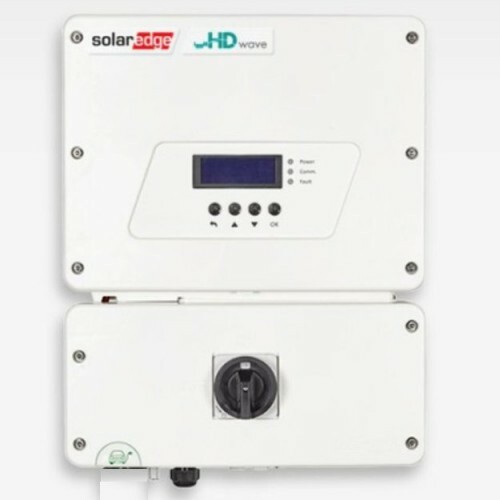 SolarEdge's HD-Wave SE3800H-US000NNV2 EV Charging Inverter offers you the ability to charge electric vehicles up to six times faster than a standard Level 1 charger through an innovative solar boost mode that utilizes grid and PV charging simultaneously. It provides AC Level 2 EV charging from both the grid and the PV system, and is designed to work with all plug-in vehicles with a J1772 socket. This product is the world's first EV charger with an integrated PV inverter and reduces the hassle of installing a standalone EV charger and a PV inverter separately. Plus, the EV charging inverter eliminates the need for additional wiring, conduit and a breaker installation. By installing an EV charger that is integrated with an inverter, no additional dedicated circuit breaker is needed, saving space and ruling out the need for a potential upgrade to the main distribution panel. The SE3800H-US000NNV2 EV Charging inverter efficiently converts DC power from the modules into AC power that can be fed into the main AC service of the site and from there to the grid. The inverter also receives the monitoring data from each power optimizer and transmits it to a central server (the monitoring platform; requires Internet connection). Whether you own an EV now or just want to be EV-ready, future-proof your home with SolarEdge. The SolarEdge EV charging single phase inverter supports full network connectivity and integrates seamlessly with the SolarEdge monitoring platform. Homeowners can track their charging status, control vehicle charging, and set charging schedules. NOTE: EV Charger Cable SE-EV-KIT-25J40-1 is required for EV Charging and is sold separately.